THE ONLY IMMIGRATION MEDICAL EXAM DOCTOR TO HAVE A 5 STAR RATING ON BOTH YELP AND GOOGLE REVIEWS! Most Affordable Exam Price. Superior Service. Click Here to Get a Quote Right Now! "Dr. Asher Ram has been practicing in his Van Nuys office since 1989 and is considered one of the most experienced and respected physicians in the LA Area. Over the past decade, he has helped thousands of immigrants with their medical examinations"
Dr. Ram is a USCIS Certified Civil Surgeon who has helped thousands of immigrants with the INS medical exam over the past years. Dr. Ram is an approved and official provider of the INS 693 immigration physical medical examination for aliens seeking adjustment of status or to complete examination requirements for permanent residency (GREEN CARD). 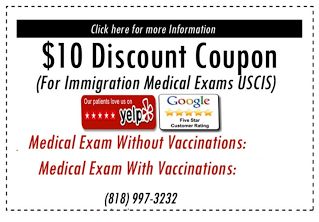 Does Dr. Ram do Immigration Medical Exams (examinations) in Los Angeles? Yes, Dr. Ram is a civil surgeon who performs the immigration medical exams in Los Angeles. See below for more information. Yes, our office is qualified to do immigration medical exams and is located in los Angeles. You may need to contact USCIS to use the civil surgeon locator. Please call our office at (818)997-3232 to schedule an appointment. Dr. Asher Ram is an approved USCIS Certified Civil Surgeon in Los Angeles County and specifically in Van Nuys Ca. For more information about the USCIS, please visit their Web site at: https://www.uscis.gov/portal/site/uscis.